This apparatus is used to study the current Vs voltage characteristics of CdS photo-resistor at constant irradiance and to measure the photo-current. Marked analyzer and polarizer for angle measurement. Absorption of light increases electrical conductivity in a solid. 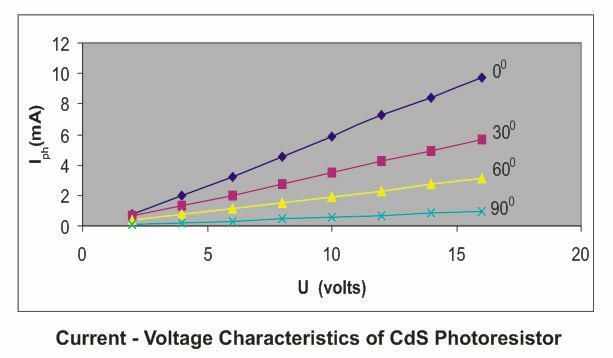 In case of cadmium sulphide (CdS) photoresistor, when it is exposed to light the transition of activator electrons into the conduction band and charge exchange of traps with holes being created in the valence band causing enhancement of conductivity. In the present setup, photo current is studied as a function of the voltage applied to the photo resistor at a constant irradiance. The angle of polarization is changed by polarizer filter. Required but not included: Power supply 12V AC/DC 5 Amp. 1 and Regulated Power Supply, 0-16V DC, 5A.